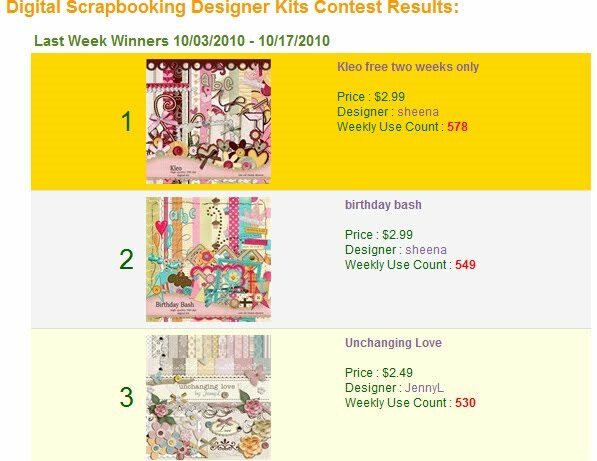 Teehee, I won 3rd place at Artscow's bi-weekly digital scrapbooking contest! My UNCHANGING LOVE kit got the 3rd spot, eventhough I think I deserve a much higher place because I have lots of quickpages and templates that I offered for free. But since it's a contest and customers have their own preference on kits, then I'm still happy for the prize. I'm so thankful that I learned how to design kits for ARTSCOW and right now, I see it as one of the successful home business that I can think of. It's hard to design kits that can take up a week to finish and 2 weeks the most for making various templates but all the hard work will paid once the kits and templates are used by their customers. Right now, I joined the contest once again and I hope I can win the 1st place this time. I'll be sharing the kit and link on my next post.